Change is always challenging, but we are making great progress in our adaptation to an online gallery. We have winnowed down our inventory, as many of you who follow us can see, and what remains are the iconic traditional Americana pieces that have been featured in the “bibles” of great folk art, American Vernacular and American Primitive, as well as in museums and important collections we have bought. They are the pieces that tell the story of America, and have become a part of our history and culture. Our dual focus is on Outsider and Self-Taught Art, which we believe to be gaining recognition within the mainstream art world (making it Insider Art, or as it should be regarded, just Art!) The artists we feature are the ones we have fallen in love with. We do not represent artists; we buy pieces that move us and share their insights into inside and outside worlds. Our main criteria for acquiring work is enthusiasm for the piece. We believe you should buy what you love. We are in the process of changing our format for the online gallery, so expect new surprises and a lot of new material in the coming months. We will be updating the blog more often, and increasing our presence on Facebook and Instagram as well. It’s a new world for us! 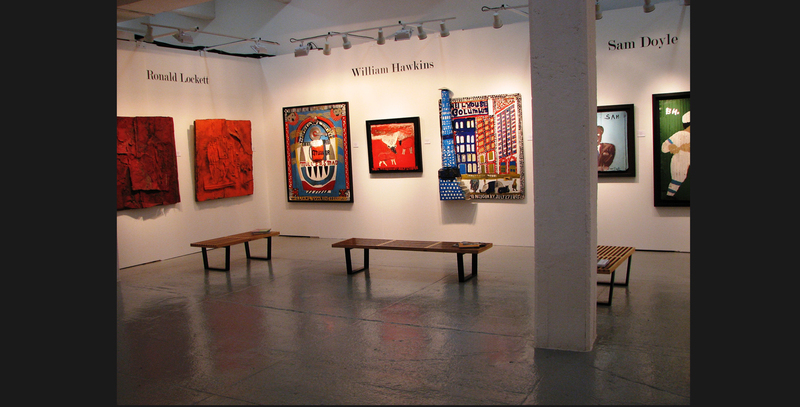 In the meantime, we participated in The Outsider Art Fair in New York in January and found a receptive crowd. Our booth was all black and white work, and we called it Absence of Color. It was a different approach to curating work of various self-taught artists, and it got a lot of attention. A few pictures are included here. This entry was posted in self taught art on March 24, 2017 by justfolk. Just came back from England where folk art abounds! There is a wonderful show of British Folk Art at the Tate Gallery which is small but quite comprehensive, although they don’t have as many trade signs, weathervanes and whirlygigs as I would have liked. There is a growing awareness throughout the UK that they have some folk treasures. 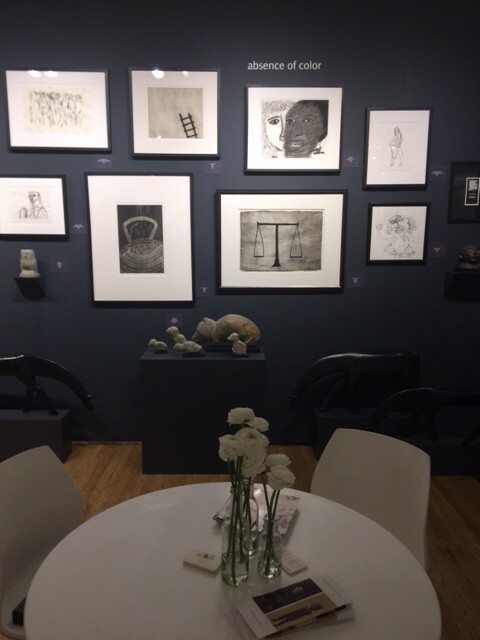 Dealer Robert Young has an incredible eye, and he and his wife Josyane took a booth at Masterpiece London which contained some terrific pieces. I just had to purchase a few for Just Folk, which we will be bringing to the Metro Show in January! Although Just Folk started our collection with Americana and American Folk Art, we have added a few pieces from England and France which look like they belong and correspond to our sensibilities! Two wonderful collage pieces from the 19th Century, an old game board similar to darts, and a huge wooden scissors trade sign came home with me to Summerland! There is also a big interest in Outsider Art and Self-Taught Art in Europe. The new Raw Vision Magazine has a feature on Bill Traylor who is near and dear to us, as you know. The whole international scene seems to be embracing raw art, art brut, primitive art, visionary art. There is a wonderful exhibit at Los Angeles Country Museum of Art with the works of Sam Doyle. It takes some patience to locate it at the museum, but is very worth seeing. So many of the works we feature at Just Folk are done by African American Artists like Doyle (William Hawkins,Jesse Aaron, Thornton Dial, Purvis Young and Ronald Lockett among them.) The freshness, spontaneity, and artistry are amazing. So glad many others are becoming aware of this 20th century artwork. This entry was posted in self taught art on July 20, 2014 by justfolk. This is the first entry on our new and updated website blog! Welcome to news of Just Folk! We just returned from our annual visit to New York’s Outsider Art Fair, which was moved from freezing January to balmy May this year for the first time. There were several advantages to the move: obviously, the weather was better! The Fair this year coincided with Frieze Art Fair on Randall’s Island, which draws a lot of art lovers to New York. Unfortunately, quite a few other Fairs had the same idea and the city was host to about 8 major art events the weekend of OAF and Frieze! This meant that foot traffic was light and speedy because people were anxious to see it all! It was also the first nice weekend in New York in months, and many people chose to go away and take advantage of the weather. It was also Mother’s Day on Sunday! 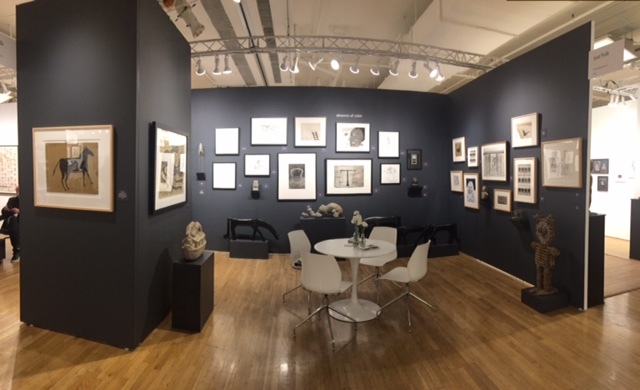 But the OAF was beautifully-staged at Center 548 in Chelsea, and we were proud to exhibit the best of our most established self-taught artists, including Bill Traylor, William Hawkins, Ronald Lockett, Martin Ramirez, and Sam Doyle. We were sad not to include some contemporary works of Jim Bloom, but were instructed that they didn’t fit the profile of the show. Check them out here on the website. He’s a very talented, insightful artist who deserves exposure. The OAF was very inclusive in the international artists it showcased, and the world of Art Brut and Self-Taught Art is very exciting. The Fair, along with the opening of The American Folk Art’s new exhibit, “Self-Taught Genius,” is highlighting the importance of Outsider Art and its inclusion in the contemporary art world. The museum’s show will travel to eight other cities throughout the country. Hope you get a chance to see it! Here’s a shot of our booth at OAF! This entry was posted in self taught art on May 25, 2014 by justfolk.